Sundaikkai, is popular as turkey berry in English. It is also called as pea eggplant or baby eggplant. It is widely used in indian, Malaysian and thai cuisine. Among tamilians(like me), Sundaikkai is famous for its kara or vatha kozhambu. When pachai or raw sundaikai is used for kozambu is referred as kara kozhambu whereas if dried sundaikai is used for kozhambu is referred as vatha kozhambu. This small berry has excellent medical properties and its good for bones. Today i am not going to share any kozhambu recipe, but a quick poriyal to accompany with sambar sadam. Even you can use pacha sundaikkai in sambar. Sundaikkai basically a slight bitter in taste, so it has to be washed well by crushing with hands to remove the seeds before used for cooking. In today's recipe i used equal amount of channa dal or kadalai paruppu to combat the bitterness of sundakkai and added coconut at the end to improve the taste. Clean the sundaikai and remove the stems, cut into half piece of each sundaikai or crush in mortar using pestle. Wash the sundaikai well for enough time or at least thrice to remove seeds from it else it may cause bitterness to poriyal. Measure half a cup of channa dal and wash well in tap water. Pressure cook for one sound or in open pan until soft cook but not mushy. Bring sundaikai in a sauce pan, add needed water to cook along red Chilli, turmeric powder and salt. Once water is absorbed., check it and switch off fire. Heat oil in a fry pan. Add mustard, allow to splutter. Throw in cumin, crushed garlic cloves, slit green chilli, chopped onion and sauté well. Once onions turn translucent add the cooked sundakkai and stir well. Allow to cook for 5 minutes. Add the cooked channa dal to it. Add salt as needed and mix well. Also little jaggery and simmer cook for 5 minutes. Finally add grated fresh coconut and mix well. Switch off the fire. Use equal portion of channa dal to eliminate the bitterness of sundaikai. Best to serve with rice, sambar and rasam. For variation try sundaikai in sambar recipe. 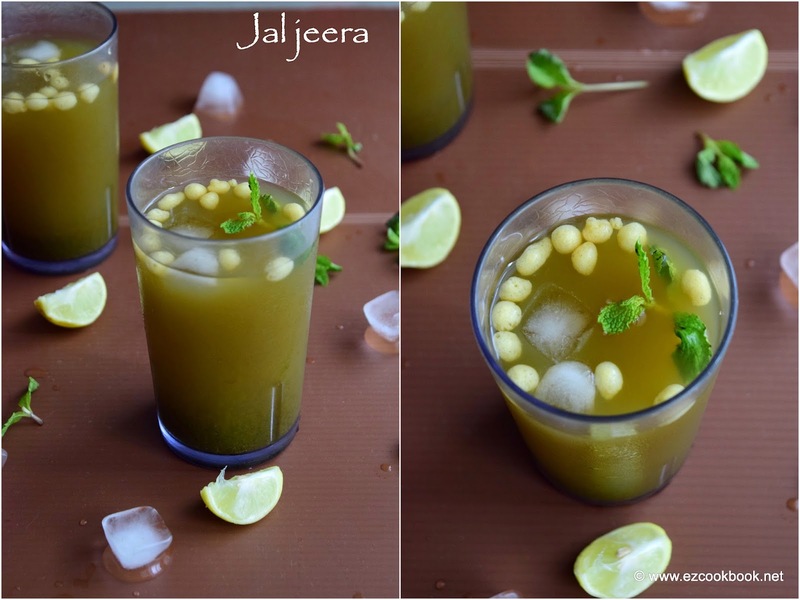 Jaljeera / jal jeera, is an addictive Indian drink and must in summer time. Jal means water and jeera means cumin, but please don't assume that it is a simple drink. It has also included with exotic flavors of indian spice and herbs. It is usually served as an appetizers or along with meal, considered it is good for aiding digestion. You can easily find a lot of street food vendors serving this chilled jal jeera in the earthen pots all the way in their mobile cart in india. I always love this flavorful, cooling, refreshing drink and can gulp more than two glasses at a time just to enjoy Indian kick. The same jaljeera is used as pani for pani puri. Wash the coriander and mint leaves thoroughly before use. Put mint Leaves, ginger, sugar, table salt, black salt, asafoetida, tamarind, cumin, pepper powder and coriander leaves in a mixer, add water and puree. Pass through strainer to remove the ginger and tamarind remaining. Add 4 cups of chilled water and lemon juice. Stir well. 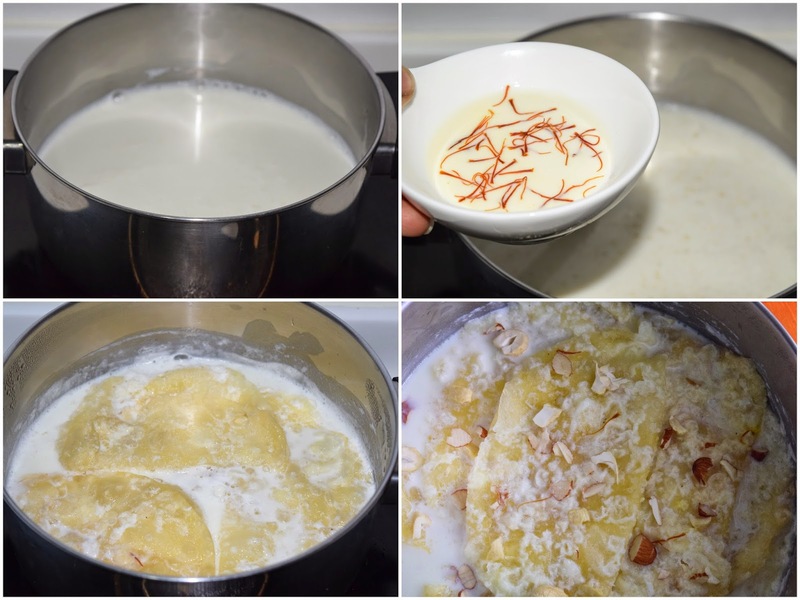 Garnish with boondi and few ice cubes before serving. Dry roast the cumin and pepper seperately in fry pan. This adds excellent flavors. If you want the drink to be really sour and tangy add more tamarind. Jaljeera easily stays good for 3-4 days, refrigerated. 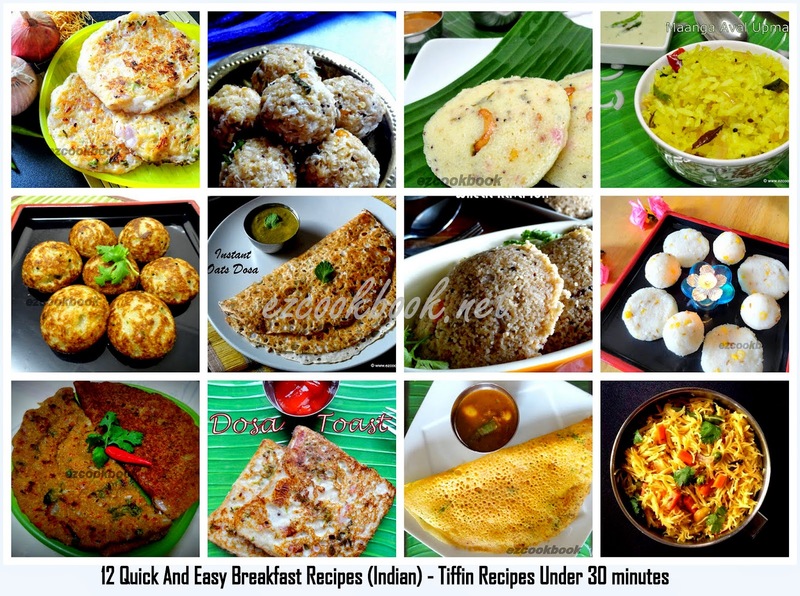 As an Indian I am very particular about my food and always prefer to cook my meals at home. At times I would love to shut my kitchen and enjoy some outside food. But it comes with a cost - it’s annoying to drive to a restaurant, struggle to park the car and stand in a queue waiting for your table. Hence I would choose to order some delicious food that can be delivered right at my doorstep. It’s really painful to browse through individual restaurant sites, finding out what they offer and also check there delivery charges. That's when I came across foodpanda which solve my hunger. Today I wanted to share few interesting aspects about foodpanda. foodpanda is a German based company, one of the most powerful online tool for food delivery in the world, operating in more than 30 countries. They believe that ordering food should be easy, fast and definitely fun! The explosive growth of foodpanda gave rise to various local online food ordering & delivery clones all over the world. They offer online menus from the staggering selection of delivery restaurants around you. foodpanda is now active in 30 cities in India and has over 4000+ restaurants available and the delivery of your food is free! It includes famous restaurants, chaat/sandwich corners, Pizza parlors, Ice cream parlors and even Cake shops. 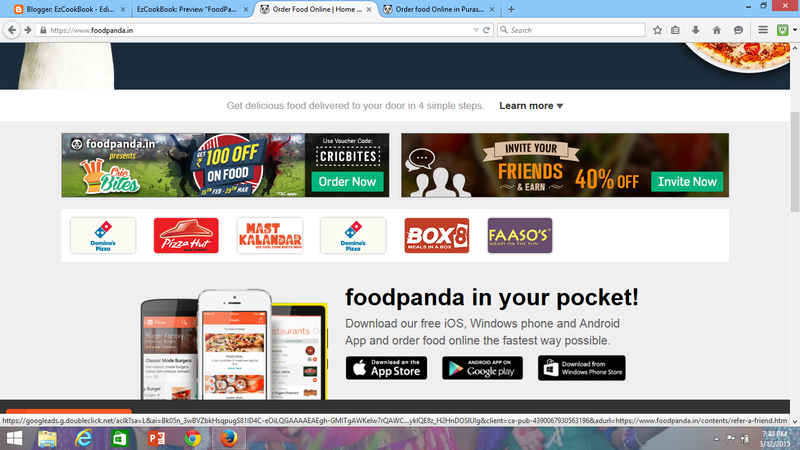 foodpanda loads very fast and helps you reach their homepage easily www.foodpanda.in. 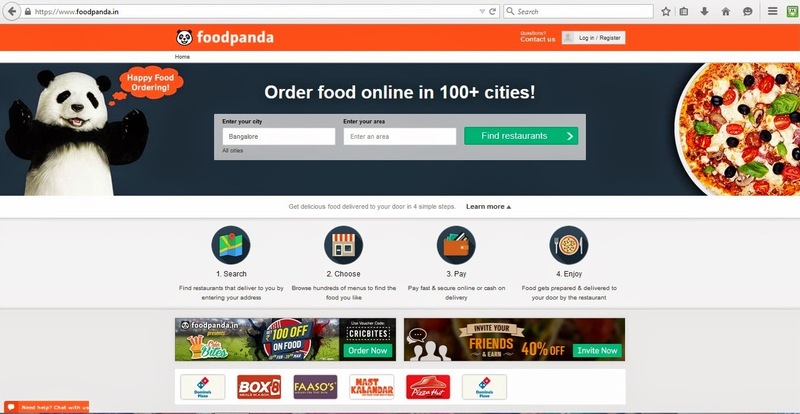 How to order from foodpanda online? Their user friendly interface, helps one to access the website easily to order food from list of nearby restaurants. Simply enter your city and postal code to find nearby restaurants to place order. Alternative, get delicious food delivered to your door in 4 simple steps. How to order food from foodpanda Mobile app? Enjoy delicious Indian cuisine from list of famous restaurants or a pizza from Pizza Hut or even a tasty burritos from Mexican restaurants with instant access to their menus. Yes foodpanda provides easy access to customers through mobile apps too. Download the free iOS, android or windows phone app to order food online the fastest possible way. o Save money by using their exclusive deals and vouchers. o You can simply customize your meal like you would do in the restaurant. o They provide secure mobile payment and also cash on delivery option. o Once you register in foodpanda you don’t need to enter your details every time you place order which saves time. o One stop to look for as many restaurants menu with wide variety of choices, detailed price list. o Remember when you invite your friend to try foodpanda, you will be rewarded with more discounts on your next order of meal.